Home/Sikh News/Sikh Protests/Bapu Surat Singh Khalsa/Both Of Bapu Ji’s Kidneys Have Failed And Doctors Have Recommended a Kidney Transplant. Both Of Bapu Ji’s Kidneys Have Failed And Doctors Have Recommended a Kidney Transplant. We are sorry to inform you…. This selfless man is dying …so those Sikhs that have completed their jail terms but are still languishing in Indian prison’s…..can be freed…..
As per latest information, Bapu Surat Singh Khalsa’s condition has further deteriorated. He’s currently admitted at the DMC Hero Heart hospital in Ludhiana where the government is force feeding him. Bapu Surat Singh Khalsa has refused treatment, citing that he is on a “fast til death.” However, the government has inserted IV tubes into his body and given him blood transfusions against his will. 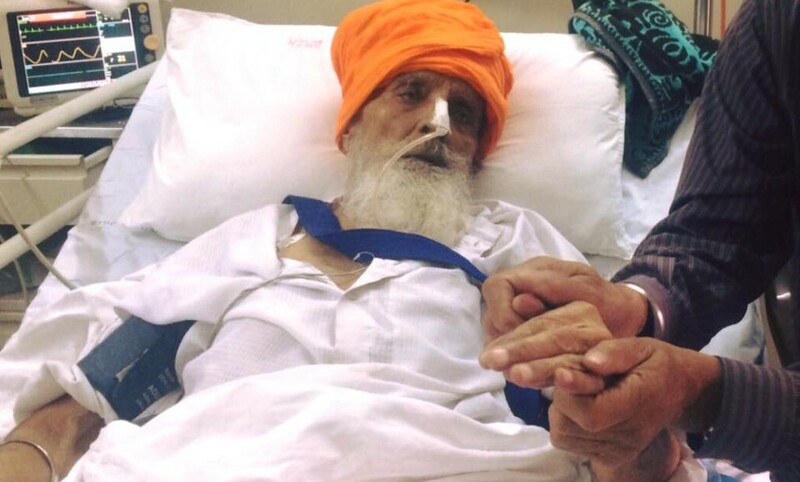 Due to the continuous injection of fluids into his body, Bapu Surat Singh is facing breathing problems. As per information revealed by the “Sangharsh Jaari Hai” team, both of Bapu Ji’s kidneys have failed and doctors have recommended a kidney transplant. Bapu Surat Singh Khalsa is on indefinite hunger protest since January 16, 2015, seeking release of political prisoners who have completed their terms but are still languishing in jails across India. Hoshiarpur | Punjab Police Beaten a Sports Man | Why Punjab Police Beaten Sikh Youth ? ?